From Left to Right Renton Middlecote, Ethel Cooper (Bowen), Molly Woodland, Tom Cooper, Flora Woodland (Cooper), George Wilfred Woodland, Katherine Woodland (Riley Bowen), Eva Cooper, Alma Woodland, Jenny Cooper, Susie Cooper, Ronald George Woodland, Ada Cooper, Ted Cooper. These three index registers extracts show the birth (Uxbridge) and marriage (Hampstead) of Ronald George Woodland to Flora Cooper, no certificates have yet been ordered. 1891 Census for Glebe farm Ickenham, Middlesex where Ronald George is living at home. His mother Mary Rebecca is head of the household, Wallace his father had died by this date (aged 42). 1901 Census for 41 Chapter Road, Willesden, Harrow, Middlesexwhere Ronald George is still living at home. 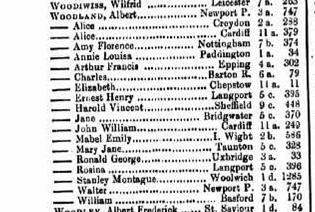 His mother Mary Rebecca is head of the household, Wallace his father had died before the 1891 census (aged 42).